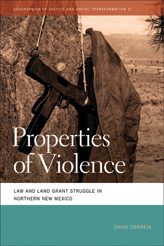 Here we’ve an excellent review by Don Mitchell of David Correia’s Properties of Violence: Law and Land Grant Struggle in Northern New Mexico. 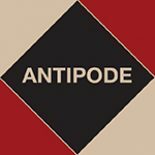 Antipode author David published the book in the University of Georgia Press’ ‘Geographies of Justice and Social Transformation‘ series earlier this year, and Don’s review can be read below or downloaded here. This is how Properties of Violence ends: with David Correia bouncing along a mountain track in an all-terrain vehicle driven by Cuban cigar-chomping, beer-swilling, ex-Olympic speed skater, current Atlanta Braves executive, and land developer Mike Plant, touring northern New Mexico luxury home sites that sell for up to three-quarters of a million dollars. Plant is hoping to turn a big chunk of Mundy Ranch into a mountain retreat for the super-wealthy, who will come there for the stunning views, as well as to hike and especially to hunt. They’ll hunt on ranchland that Plant will hold in trust as a commons of sorts, open to residents who buy a lot and build a second (or third, or fourth) home. For his part, Jim Mundy, the son of Bill Mundy who carved the massive Mundy Ranch out of the even more massive Tierra Amarilla land grant, and through a series of legal maneuvers and vigilantism eventually cleared title to it – quieted the deed, to use the term of art that is so central to Correia’s brilliant book – hopes to sell his remaining portion of the ranch to the Jacarilla Apaches who would then hand it over to the U.S. Government in the form of the Bureau of Indian Affairs, which in turn would hold it in trust for the Jacarillas to use in common. If the purchase goes through it will add to several others the Jacarillas have recently made on the Tierra Amarilla land grant, which has greatly expanded the tribe’s reservation – and its access to wealth in the form of land, minerals, animals, and timber. As Correia makes clear – and has made clear over the course of this excellent book – this outcome (Plant setting aside a massive commons for his wealthy vacationers; the U.S. government holding land in trust, as a commons, for the Jacarillas) is deeply ironic. It is ironic because the deeds that make this possible were quieted only by denying the very possibility of common property and violently enforcing that denial. Property, Correia shows in compelling detail, is only quieted through acts of sustained violence. Violence is at the heart of property. Property is violence reified. Correia tells the story of property’s violence through a history of the struggles over the Tierra Amarilla land grant, a history that has occasionally burst spectacularly into broad public consciousness as night riders, FBI agents, Ku Klux Klanners, barn-burners, and National Guard tanks rampaged across the land, but mostly has simmered (and seethed) in courtroom battle after courtroom battle. Drawing on theories of the geography of law and property as developed by Nicholas Blomley, David Delaney, and a raft of critical law scholars, as well as impressively deep archival work, Correia shows us how real property is contested, constituted, and settled – transformed from a living relationship to, in the eyes of the law, a settled, personal, attributable thing, in which traditional practices of common use are not just made to take a back seat to a single, clear owner with exclusive rights over the space, but are simply not even seen anymore. For scholars of property or enthusiasts of Blomley’s work, the broad outline of Correia’s argument will be familiar. But what is important in this book is the deep historical detail coupled with Correia’s insistence, fully illustrated, that property is never settled, deeds are never quiet, resistance to new regimes of property is always present. As Correia details in a prologue and chapter 1, the lands of the Tierra Amarilla grant – in the Rio Chama watershed of the far north of what was later to become New Mexico and extending into southern Colorado – were originally used and occupied by a range of Ute and Apache bands who used the land for farming and hunting. The region was something of a borderland between Indian groups and represented a territory just beyond Spain’s control as it sought to extend its hegemony over its northern frontier. Spanish and later Mexican governors sent surveying parties and sponsored colonization, but they took little hold. Utes and Apaches pushed back and defended their land, raiding settlements and harassing occupants. Even so they remained strangely invisible to colonial officials, who pretty much refused to admit their existence, a fact important to the original land grant when it was made by Mexican authorities in 1832. With the US ascension to power in the region after 1848 a concerted effort was made to remove the Indians from the grant which met counter-resistance in the form of Indian raids on sheep farms, horse-stealing and attacks on settlements. When the last of the Utes (and before them the Apaches) were finally forcefully removed – after a gun battle with the Eighth Cavalry – the way was presumably cleared for settlers to cement their claims to private property and common rights on the grant. The remaining five chapters detail just how chimeric this dream was, at least for the small-time farmers and sheepherders who had been the advance guard of European settlement. Even though the original grant to the property-owner and cattle rancher Manuel Martinez required that numerous small plots be distributed to claimants and that pastures, water courses and holes, forests and roads all be held in common for the use of all property owners within the grant, their tenure and use rights were hardly guaranteed, and almost always contested by large landowners and incomers. During speculative frenzies in the last three decades of the nineteenth century, small plot owners across the region (not just on the Tierra Amarilla) saw their lands and common-right claims turned into “securities on international markets. Whole land grants were bought and sold” (p. 50). As sheepherders and small-farmers sought to maintain their rights, a passel of attorneys – some legitimate, others not – appeared on the scene seeking to represent them and push their cause, in some cases working out deal to press small-holder’s claims in exchange for part-ownership of their land. Such a claim came with rights to the common, and a new territorial law in 1876 made it possible for a “part owner of a common property land grant to petition the territory for the partition of a land grant”. As a result, though small-holders won their cases, they lost their land (p. 56). Through these and numerous other practices small sheepherders and farmers were dispossessed of their land, and commons were privatized, just as surely as the Utes and Apaches before them had been dispossessed. Smallholders resisted and Tierra Amarilla was anything but quiet, especially as the century turned, New Mexico gained statehood (1912), the forced modernization of World War I hit even this marginal land, and a new force appeared, the Ku Klux Klan. In a book that is on the whole convincingly argued and rich in its insights, Correia’s discussion of the KKK is less so. The appearance of the KKK in northern New Mexico presents historians with a paradox (which Correia nicely outlines). On the one hand it can be understood within the context of the nationwide post-World War I resurgence of nativism that was particularly strong in the intermountain west (Colorado hosted a particularly vigorous Klan presence; Denver’s Mayor Stapleton was a member as were many other prominent politicians). On the other hand those invoking the Klan in Tierra Amarilla (in handbills, etc.) seemed to be non-elite Spanish-speaking smallholders, perhaps affiliated with another organization, La Mano Negra, which, given that elsewhere in the region (Colorado especially) the Klan was largely an organization of white elites, is confounding to say the least. Correia’s argument, which takes up all of chapter 3, is that the invocation of the Klan was a tactic by smallholding land claimants seeking to frighten the New Mexican elite which was bi-racial: a marriage of convenience between Anglos and Spanish-speaking New Mexicanos who identified as European. The appearance of a white supremacist Klan would interrupt the balance of power. This is not an unreasonable analysis. But the problem is that for all his interesting explication of the literature on race in the American southwest as well as previous research that had tended to ignore the Klan because it was so confounding, Correia just does not have much evidence for his argument. Unlike the rest of the book, which is so deeply rooted in the historical record, there’s just not a lot here. The result – to me at least – is that because the discussion of the Klan takes up so much of the book (one of six chapters) is diversionary. It detracts from the thrust of the argument – about the role of multifaceted resistance to land grabbing and attempts to quiet titles – rather than adds to it. The remainder of the book adds to it. The story Correia tells is rich and deep and full of struggle as smallholders and sheepherders fight to gain or regain to rights to the use of the land and courts, even when presented with incontrovertible evidence, mostly refused to even see their presence on the land, much less acknowledge and ratify it. Still, this struggle assured that titles were rarely if ever quiet and what was in essence a low-grade guerrilla war marked the territory all through the first six decades of the twentieth century. Matters came to a head in the 1960s. In 1958 a Pentecostal preacher named Reies Lopez Tijerina arrived on the grant and, learning of the long struggle, began organizing. He and his followers grew more radical and bold in their tactics, attracting the attention of the FBI (under COINTELPRO) among others, and eventually worked with organizations to seize the land they knew was their own, declaring the lands of the Tierra Amarilla to be sovereign and no longer under the jurisdiction of New Mexico or the US. They established a border patrol, issued titles and hunting licenses. All manner of legal and policing maneuvers ensued eventually leading Tijerina and some followers to stage a raid on the county courthouse, a shootout, and eventually Tijerina’s arrest. He became a folk hero and was invited by radical organizations, including the Black Panthers and Nation of Islam, to speak. Tijerina’s actions also helped lead, by the 1970s, to law enforcement classifying land-rights activism as ‘terrorism’. Of particular police focus was the rise of La Raza Unida, the Chicano political party which among other things campaigned against a corrupt and violent local sheriff who operated as a political boss and in particular was a fixer for land development interests that were seeking to turn parts of Tierra Amarilla into a ski and hunting resort. Charges of terrorism, Correia shows, were used strategically to dampen down protest against tourism development. Nonetheless, more land occupations ensued. More violent removals of occupiers took place. More legal maneuvering filled the court dockets. “Given the long history of efforts to remove land grant heirs from Tierra Amarilla”, Correia writes (p. 166), “it is important to take seriously the ways in which legal authorities have reworked tactics of removal. The police violence of the [Sheriff] Naranjo regime and the frequent claims that land grant activists are domestic terrorists calls into question the claim of law enforcement officials that they do nothing more than uphold the law. Any distinction between lawmaking and law preserving or claims of law’s objectivity and neutrality collapse under the weight of a history of violence against land grant members”. As Correia makes clear this is a lesson – a truth – far larger than the story of Tierra Amarilla. The great advantage of Properties of Violence is that through deep historical research and brilliant storytelling Correia makes this larger truth plain for all of us while at the same time providing a rich history of this specific territory and its long history of unquiet title. This is engaged, critical, historical geography as it ought to be done. This entry was posted on 21 June 2013 by Antipode Editorial Office in Reviews and tagged agriculture, historical geography, land grants, land rights, land rights activism, law, New Mexico, policing, property, security, violence.